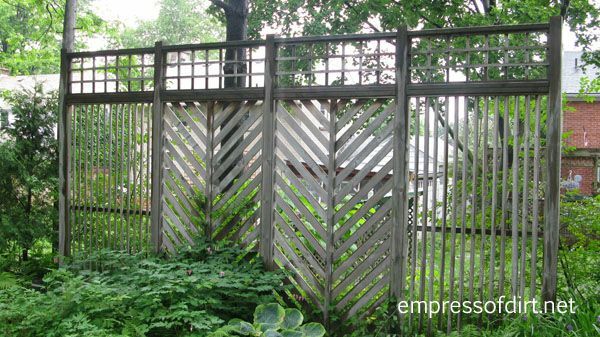 These fence screening ideas offer ways to add privacy to your garden. 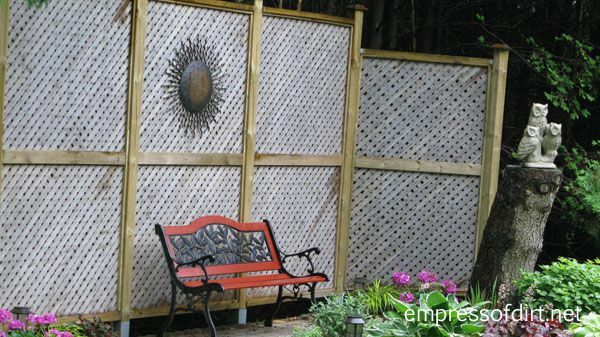 If your neighbours can see into your yard, these privacy fences can block their view. Often, you do not need a lot of screen to solve the problem. If a low fence height is a problem, you can also make a fence taller. Most of us would like the entire backyard garden to be private so we can feel comfortable without feeling like anyone is watching. For me, it’s my favourite place to nap and I sure don’t want any eyeballs on me while I do it! While natural barriers like trees, hedges, shrubs, and vines are the most pleasing choices, they also take a long time to establish. 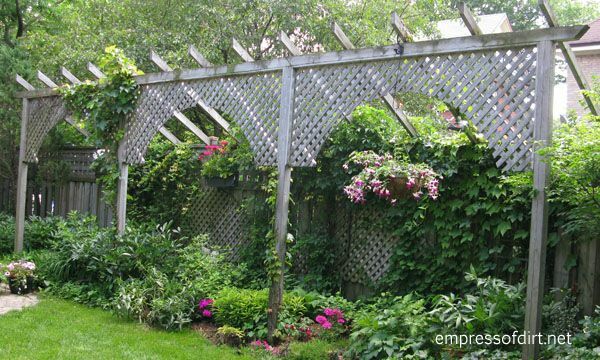 An immediate solution is to build a privacy screen or fence, immediately followed by long-term plantings that will further improve the privacy in future years. There is a trick I will show you for placing the screen to ensure maximum privacy. 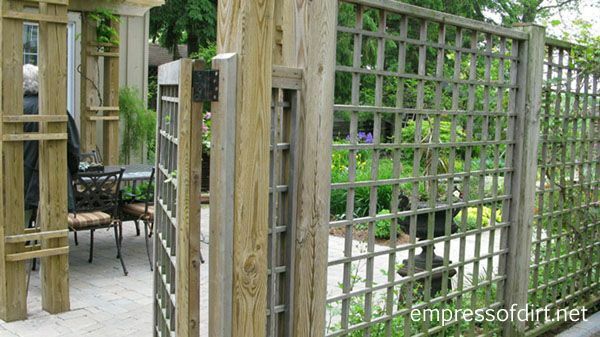 At the end of the post you will also find several design ideas for privacy fence and screens. Find out the local bylaws and ordinaces regarding fences and garden structures to understand what is permitted in your area. Also enquire whether any building permits will be required and if you will need to submit plans for approval ahead of time. 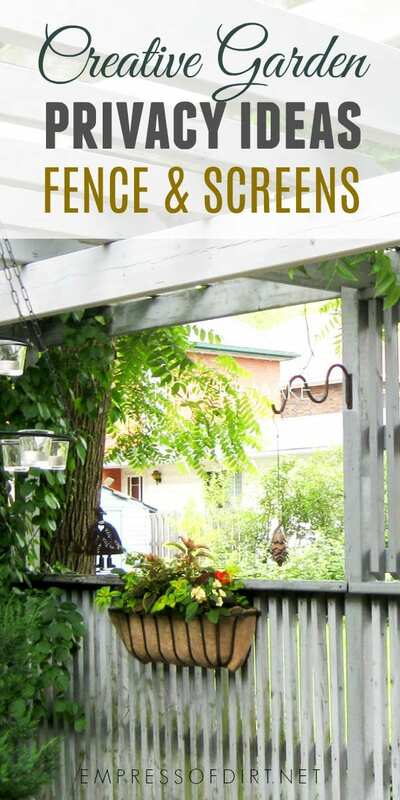 A book like this one The Fence Bible: How to Plan, Install, and Build Fences may help you settle on a design. Check your local library for a copy. 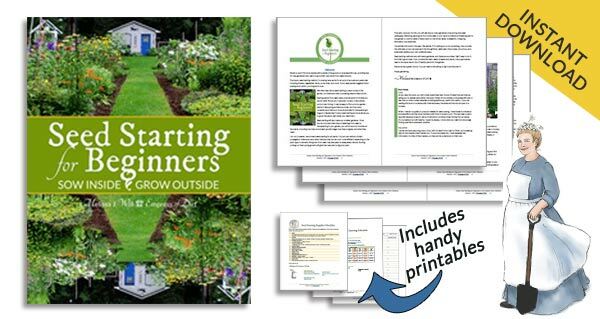 Realistically speaking, if you want to make your garden private, you should focus on one or two key areas and place your screen(s) to maximize privacy there. 1. 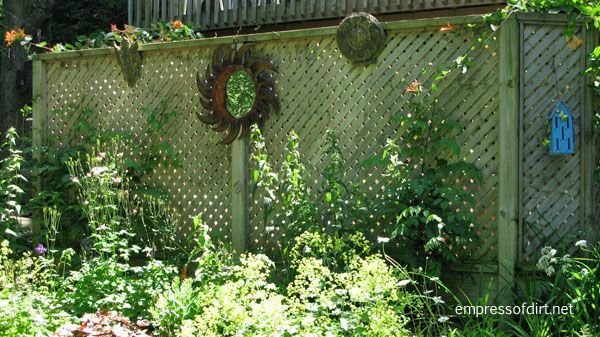 What location in your garden is top priority for privacy? 2. What are you trying to block out and where is it located? Where are those eyeballs you don’t want watching you? 3. Do you also want to block out sound (yours or the neighbour’s)? I want the sitting area at the back of my yard to be private. The neighbour to the south likes to watch us from his second storey bedroom window. He’s too far away to hear our conversations so it’s just visual privacy we need. 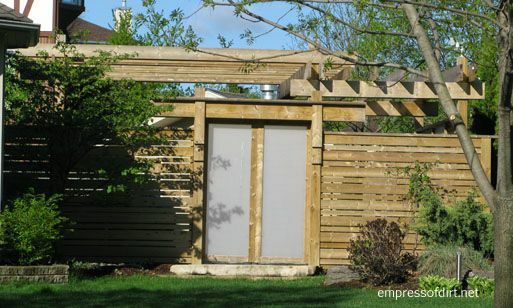 The higher the neighbour’s view, the closer you want the privacy screen to your sitting area. The more you want sound to be blocked, the denser the screen should be. If neighbours are really close, a full privacy fence with the wood butted together (no gaps) is best. 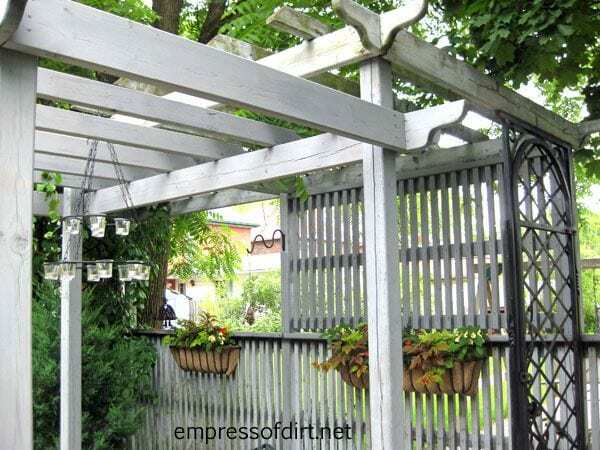 If neighbours are farther away, a trellis style screen will probably work (and generally looks much nicer near a patio). Again, establishing some natural barriers likes trees, hedges, shrubs, or vines, will add more privacy in the future. Also, once they have matured, you may even wish to remove the screen or fence. Until then, build something that fully protects the most important area for privacy in your garden. If you have privacy there, the rest won’t matter so much. Here’s a bunch of privacy lattice products on Amazon to get ideas for the style you like. Want to make a chain link fence private? See this post for a variety of ideas. I hope you’ve found some useful ideas. 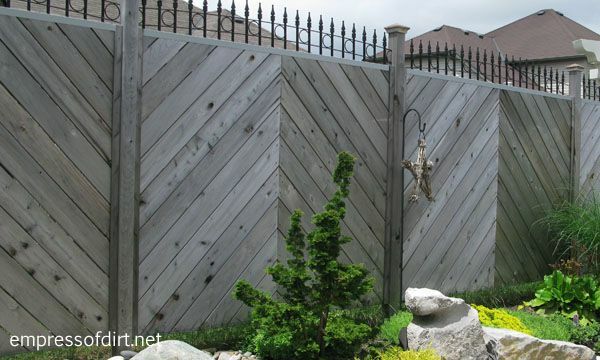 If you’d like to make an existing fence taller, this shows some ways to do it. 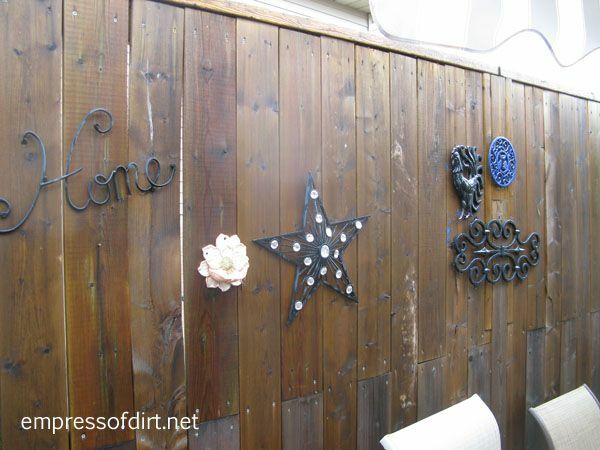 25+ Creative Ideas For Garden Fences | Hang up your outdoor art! How to Make a Fence Taller | Need more privacy? Here’s how! See the section on disguising chain link fence. There’s some products there to attach to existing fence. Also, obelisks and trellises placed in the yard can be higher than fences and, with thick vines on them, can be very good visual barriers. One of my best natural tricks is to let my asparagus patch grow tall each summer. It provides a very nice privacy screen. Hi Melissa – we just added a much needed deck to our bungalow – the back is a walk out so we do look down on our neighbors yard. My neighbor called me and said now that I look onto his yard I need to add some privacy fencing for him. I have two comments – One – we do no have our chair facing his yard – He is over 80 and all that is back there is weeds and a picnic table that is older than me….Two if he wants privacy shouldn’t he add something that he is satisfied with to his own home? Interesting situation. I guess the new arrangement has left him feeling exposed (though, as you described, you don’t overlook him). I can’t imagine any bylaws say the burden is on you to accommodate his wishes but it would be a goodwill gesture if you did. Also, logistically, it’s probably much simpler for you to add something from your location than for him to try and do something from down below. Ultimately, unless the law says otherwise, it’s your choice. If it was me, I’d do something. Hi Melissa, I am one of the new kids on the block. Your blog is wonderful and full of great ideas that I can use. We just down sized and moved to a small home with a big back yard. I also have a two car detached garage that I plan on decorating. However, I should not drill holes into the siding so do you have any ideas? I thought of putting up lattice along the side and attaching it somehow. That way I can just hang things on the lattice. I can’t wait for spring to begin. Hi Vivian, Welcome! There are 3M hooks made for outdoors and they work on siding. They’re not really cheap but they work. Any idea about what the cheapest option would be? 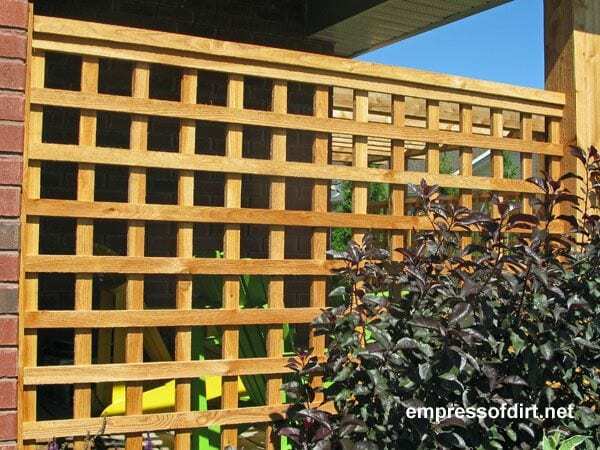 I’m looking to create a little privacy in my own small backyard with a fence, but the pricing on a lot of the more attractive prefab fences is more than I’d like to spend. You would need to price the materials for each project in your area to know what’s most economical. You are so right about that – any other hobby would be better!